These last few years the forest resource is increasingly prized especially due to important needs in wood energy. Traditional crops are widely used, however an important resource such as stumps or difficult trunks (knotty, large diameter) are few or not valued. Splitting the wood is the way to value this unused resource. Especially as splitting wood, allows fast and natural wood drying. It also gives to firewood better quality and guarantees superior combustion. Axe has been the one and only tool used to cut firewood since earlier times. It is a work which requires skill and strength. There are many firewood depots in the country where the wood is cut using axe. Even in this era of LPG cooking the demand for firewood has not come down. Firewood is not only used for cooking but also for boiling water. Gas/Electric Geysers are used in the urban areas but firewood is still extensively used in villages for boiling water. Splitting of firewood using axe is tedious job. After the advent of hand held chain saw, the process of cutting wood into smaller lengths has become easier and faster. But for lengthwise splitting of wood, chain saw cannot be used when the wood is for firewood. Cutting wood using chain saw makes the surface of wood smooth. Firewood surface should have sharp edges or splinters in order to catch fire easily. 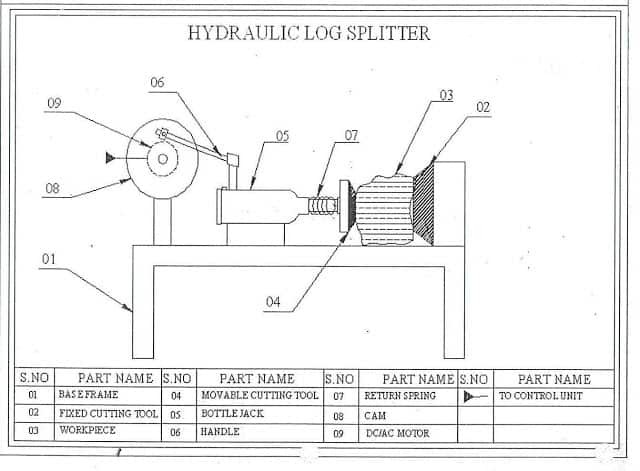 Hence if a machine has to be designed for log splitting, it should split log such that the effect is similar to that of splitting using axe. In the present design, the aim is to speed up the process of splitting logs and reduce the effort and cost. A mild steel cone having v-thread on its surface (Taper thread) is used as a tool for splitting firewood. The tool is fit to a shaft driven by an electric motor. Log is fed such that longitudinal axis of wooden log is perpendicular to the axis of rotation of the tool. The speed of the motor is reduced by using the v-belt drive and torque is increased to suit the requirement. A three phase AC induction motor is used so that the direction of rotation can be reversed if the tool gets jammed in the wood. 1. To split wooden logs for firewood purpose. 2. To split logs in such a way that it catches fire easily. 7. To avoid the use of skilled labour. 10. To split all kinds of logs- dry, wet, with knots etc. Horizontal wood splitters are the most common style and generally include tires along with a tongue to hook to a trailer hitch so you can pull them around from place to place. They can also be stationary and be set up to run mass amounts of wood through them. With horizontal wood splitters you simply lay the log down on the track and allow the hydraulic ram to force the splitter head into the log as it splits the log in half. Choose one of our horizontal wood splitter plans. o use a horizontal log splitter, you pick up the logs and lay them on the log splitter i-beam or tray system for splitting.